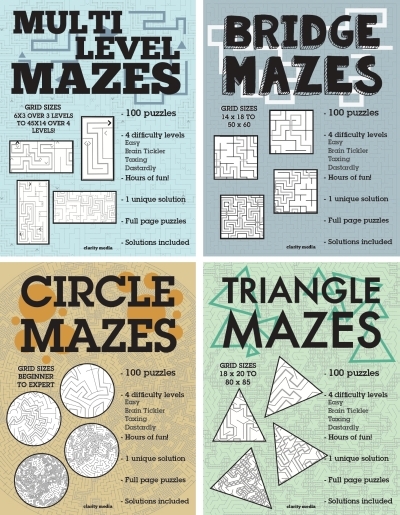 Are you a fan of mazes but need something slightly more challenging than the standard grids? Look no further! Our new range of maze books feature 5 different grid styles with different rules for each. Some require more brain-power than others, but one thing that is sure for all books-there are hours of fun to be had! 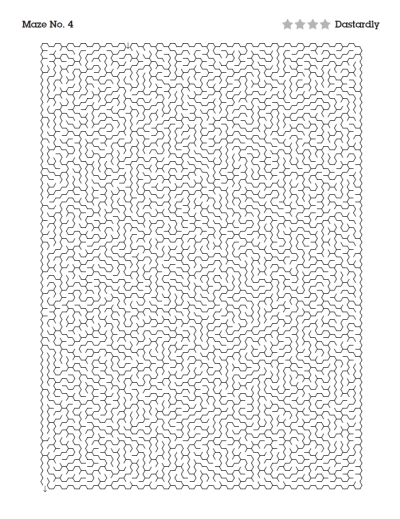 These grids are typically featured at one maze per page with the exception of multi-level puzzles where the grid size has the ability to be much smaller, so we have packed more in on every page. They are all printed on 8.5x11inch books so there is plenty of space to reach the end path without any eye strain! Each book has puzzles split in to four different difficulty levels; Easy, Brain-tickler, Taxing & Dastardly. These levels are mixed throughout the book so there is always a new challenge just around the corner! Difficulty levels are marked by a star at the top of the page, from 1-4. Solutions are featured towards the end of every book, so once you have completed the maze and found your way out- check to see if you have the right path!